Is it really a star? The Star 2 is a decent smartphone. The voice control aspect won't excite many, but it's a promising step in the right direction. 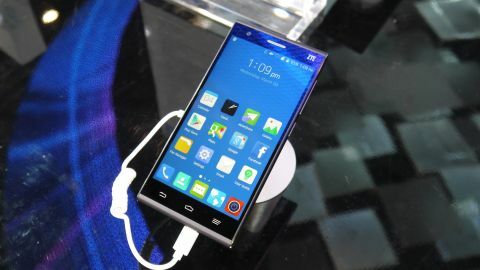 While ZTE has a big presence in Asia, it's yet to break into other markets in the same way, but at the Chinese's firm booth at MWC 2015 its latest handsets and edging closer to the standards expected from consumers in other territories. A good example of this is the ZTE Star 2, a nicely designed handset with freshly update voice recognition for the English language - a clear signal of intent that it will be coming to Western markets. I was told Europe could expect the Star 2 to arrive during Q2 (Apr-Jun) of this year, although exact countries are currently unknown, as is the price. The phone looks nice, with a rolling top and bottom edge and a silver rim providing a little bit of premium styling. It's a plastic affair, but the Star 2 feels sturdy enough with its glass front and back, and it sits nicely in the hand. At 6.9mm thick the ZTE Star 2 is suitably slender, and the limited bezel surrounding the screen keeps the proportions to a manageable 140 x 69.2mm. Power and volume keys reside on the right side of the device, while on the left you'll find trays for a microSIM and microSD. The handset's internal speaker is also located at the bottom of the left side, a placement which isn't the most inspired. When held in one hand the speaker is usually covered by your palm, and in landscape a similar muffling occurs. The 5-inch full HD display is excellent, it's bright and colourful which makes using the Star 2 a more enjoyable experience. It running Android 4.4.2 KitKat, which isn't the latest version 4.4, let alone Android 5.0 Lollipop. There's no word on whether it'll get a Lollipop boost in the future, but I'd say it's pretty likely. You don't get stock Android though, with ZTE applying its own interface design - dubbed MiFavor - over the top of Google's creation. Sadly, it's not the best attempt I've seen. It's very similar to Huawei's Emotion UI with its slightly childish icons, vibrant colours and lack of an app tray. Android purists probably won't like it, but all the functionality is still there and it is easy for first time users to pick up. I found performance on the ZTE Star 2 was pretty good thanks to a 2.3GHz quad-core processor and 2GB of RAM running the show. It was disappointing to find the processor was a Snapdragon 801 chip, which has been replaced not once, but twice by the 805 and more recently the 810. The handset ran smoothly with general operation not causing any problems. I did find applications weren't the quickest at loading up, but it's a very minor point. It's the voice control options on the Star 2 which ZTE is really pushing, with the ability to make calls, open and close apps, search locations while driving and take photos all with your voice. Many people are still uncomfortable with speaking to their phone, especially in public places, so the appeal of these options will be limited - but in certain use cases such as driving they do have a clear advantage. With no internet connection, SIM card or contact book and in a very noisy convention centre I couldn't put the voice features to the test, so I'll be interested to see how it performs in the full review. ZTE has equipped the Star 2 with a couple of strong cameras, a 13MP round the back and a 5MP option up front. Performance was slick and speedy, with an instant shutter button and even under the bright lights of the convention centre I was able to take a couple of pretty decent snaps. In terms of battery life the 2300mAh should at least see out a day, but you'll have to wait for the full review before we can say for sure. The ZTE Star 2 appears to be a pretty accomplished smartphone with a decent set of specs and good design. It'll likely be limited by hit and miss availability, and there's no word on pricing just yet, but if you're looking for something a bit different the Star 2 could fit the bill nicely.